We’ll be launching our final research findings this month. 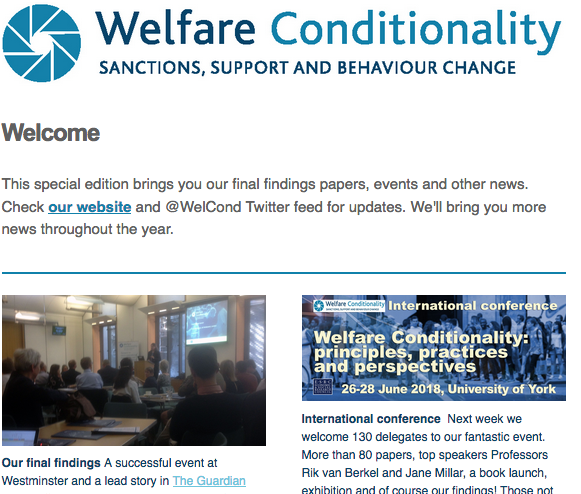 It’s the culmination of our five-year research into welfare conditionality, involving six universities and more than 600 respondents. Huge thanks to everyone who took part, it’s much appreciated. The London event is on Tuesday 22 May, 4.30pm, in Portcullis House near the Houses of Parliament. We are grateful to York Central MP Rachael Maskell for sponsoring this event. To attend, please email our Project Manager fleur.hughes@york.ac.uk. The Salford event is on Wednesday 18 July. To attend this event please email researcher Lisa Scullion L.Scullion@salford.ac.uk. For details of the Glasgow event please email us.